She was one of two women running to fill Sen. Jeff Flake's seat. 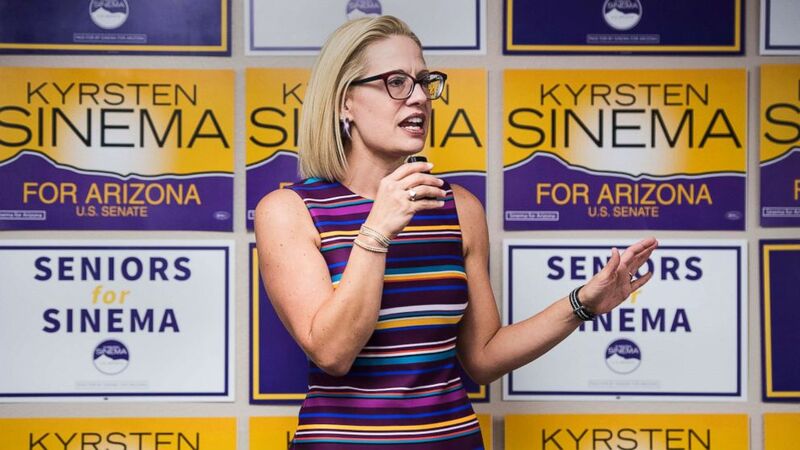 Kyrsten Sinema faced a lot of attacks during her historic – and ultimately successful -- bid for the open Senate seat in Arizona. Photos of her protesting the Iraq War in a pink tutu, old audio clips that she said were taken out of context, accusations of treason and dirty negative ads implying the threat of imminent nuclear war if she is elected all played a role in the state’s hotly contested race. But in spite of the attacks, she won her race against her Republican opponent, Rep. Martha McSally, though many votes are still being counted. McSally conceded on Nov. 12, six days after the election. Sinema, a three-term Democratic Congresswoman and native Arizonan, spent much of her campaign focused on touting her record as a self-described moderate and focusing on issues like health care. “They’re looking for elected leaders who will just roll up their sleeves and get the job done,” she said. (Bill Clark/CQ Roll Call via AP) Rep. Kyrsten Sinema speaks to supporters at the United Food and Commercial Workers union in Phoenix, Ariz., Oct. 21, 2018. Sinema, 42, introduces herself on her campaign website as someone who "knows firsthand the challenges everyday Arizonans face.” She goes on to note how her family “struggled to make ends meet” and how they were homeless for a time. Born in Tucson, Sinema’s family moved to the Florida panhandle when she was a child. “For three years, her family lived in an old gas station -- a rectangle building with no electricity or running water,” her official congressional biography states. Some details about her family's financial struggles were questioned in a September New York Times article, prompting relatives, including her mother and stepfather, to issue statements supporting Sinema’s account. “With no source of income, we lived in Andy’s parents’ closed country gas station without electricity, bathroom facilities or running water. With the assistance of family, friends and our church, we overcame the trials that we faced and moved into a farmhouse less than three years later,” Andy and Marilyn Howard said in a statement released by the Sinema campaign in response to the article. Sinema returned west when she attended Brigham Young University on a full scholarship, according to her congressional biography. She went on to earn a master’s degree in social work, a law degree and later a Ph.D. in Justice Studies from Arizona State University. Sinema worked as a social worker and criminal defense attorney in Arizona, and taught at Arizona State University for years. Rina Parisi, 62, met Sinema when she was studying for her master’s degree in social work. A longtime registered Republican, Parisi is now canvassing for Sinema in Arizona. Sinema’s first formal foray into politics came when she worked for Green Party candidate Ralph Nader’s 2000 presidential campaign. In 2002 she ran for the Arizona State House of Representatives as an Independent affiliated with the Green Party, but lost and came in last place. One of the most talked-about ads in the current Arizona Senate race came when her opponent, who served in the Air Force for more than two decades, compared her time as a fighter pilot to a 2003 picture of Sinema protesting the Iraq War in a pink tutu. Sinema ran for the Arizona State House of Representatives again in 2004, this time as a Democrat, and won. She was re-elected until she ran for and won a seat in the Arizona State Senate in 2010. She was elected to Congress in 2012, representing Arizona’s 9th district which includes parts of Phoenix and all of Tempe. Sinema does not regularly speak about her personal life on the campaign trail, but she was the first openly bisexual member of Congress when she was elected. If elected to the Senate, she will also become the first openly bisexual person in that chamber as well. One title that either winner of the Arizona Senate race will inevitably hold is being the first woman to represent the Grand Canyon state in the Senate. (Matt York/AP Photo) U.S. Senate candidates, Rep. Martha McSally, R-Ariz., left, and Rep. Kyrsten Sinema, D-Ariz., prepare their remarks in a television studio prior to a televised debate, Oct. 15, 2018, in Phoenix. While partisan politics is rampant, especially in election years, Sinema has not actively talked about her party affiliation. “Those are not issues that are Republican or Democrat. Those are just issues that Arizonans have every day to try and take care of their families and get that shot at the American dream,” Sinema told ABC News in September. But the battle for Arizona’s open senate seat has veered away from policy debates at certain points. A 2011 video where Simena is seen calling Arizonans "crazy" and a 2003 clip in which she said that she wouldn't care if an American joined the Taliban were both used in attacks against her. Sinema has dismissed the clips, and when McSally called her treasonous for her Taliban comment in a debate, Sinema said the attack was a reflection of McSally's approach to campaigning. "Martha has chosen to run a campaign like the one you're seeing right now, where she's engaging in ridiculous attacks and smearing my campaign and she's just trying to cut-cut-cut and not share the full picture,” said Sinema. “Martha’s trying to make this Senate campaign about me, but what we know is this campaign is about everyday Arizonans." In at least four of her campaign ads, Sinema doesn't even note that she's a Democrat, describing herself instead as "independent." Sinema’s record also shows that she votes with Republicans more often than most Democrats currently in Congress. According to 538’s congressional tracker which evaluates how often members of Congress vote with the Trump administration, she has the fourth-highest record of any Democrat, and the highest percentage of any Democrat in Arizona. Sinema voted with the Trump administration 62 percent of the time according to 538, which while high for a Democrat, is predictably lower than her Republican opponent McSally, who voted with the administration 98 percent of the time.